We face challenges every day and often, money seems to be the solution to it all. To top the list of our problems, sometimes fate gives us one huge challenge that is too hard to resist. Fortunately, one garbage collector managed to do the right thing, even when he was presented with a tough situation wherein most men might want to do otherwise. 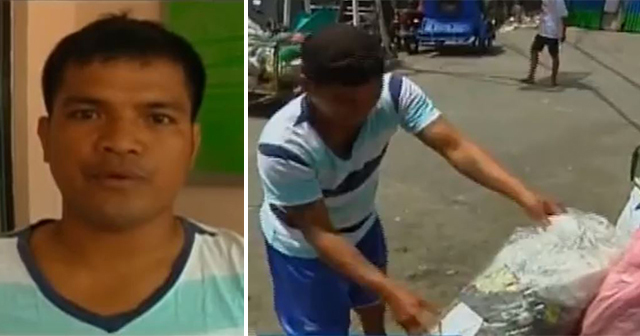 The story of a garbage collector named, Emmanuel Romano was featured in GMA News’ ‘Unang Balita’. Romano was currently struggling for money for the medical help his child needs, yet when he found a plastic bag with tons of cash inside, he managed to do the right thing and return the money to the owner. What a hero! Romano shared his experience, “Kinakabahan po ako, nakita ko po ‘yung pera, tinabi ko po muna sa isang gilid. ‘di ko po muna pinakita sa mga kasamahan ko,” [I got nervous when I saw the money, so I set it aside without telling my colleagues.] Even though the plastic of cash could help ease his struggle, he decided he would return it and did not keep it for himself. He also admitted that his newly born child is at the hospital and was sick. It is also clear that the family’s income came from Romano’s garbage collecting job which may not be enough to support his child’s medical bills. Even if he is facing these kinds of struggle, Romano decided to return the Php. 500,000 cash to the Barangay Hall after he finished his work. When the owners of the money came, they were enthusiastic to meet Romano and were very thankful to him. They shook hands with him, indicating the huge respect Romano earned from them. One of the owners told them that the wife was not aware of the money inside the plastic bag and unintentionally threw it outside together with their trash. To fully express their gratitude, the owners decided to support Romano financially and offered to pay the medical expense of his child. Along with this, the Barangay Hall promised to promote him or give him a salary increase as a reward. The barangay officials also promised to help Romano renovate his house. No matter what challenges face you, there is always a better choice that may help you in the long run. It is great to hear that there are honest people that are fittingly rewarded. Romano stands as an example of an honest man, an inspiration to a future generation and a beacon of hope to this world.